Circle of Blue’s senior editor starts his second of three weeks reporting in the field from China, where new infrastructure over the next five years will give a big boost to farming in China’s northeastern HeilongJiang Province. 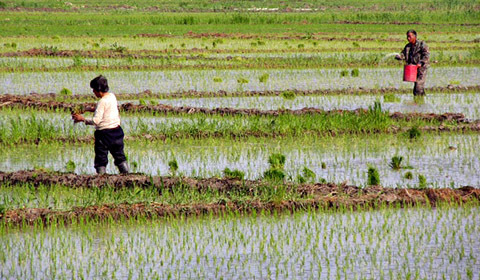 Rice farming in Heilongjiang Province in northeast China. Production is expected to increase 20 percent over next five years, but, because of investment in water-saving irrigation systems, water use will increase one percent to two percent during the same period. HONGXINGLONG, China — Just over year ago, I reported on the urgent water shortage developing in the Yellow River Basin, which lies to the west of Heilongjiang. The provinces of the Yellow River Basin produce 20 percent of the country’s grain and 70 percent of its coal, China’s primary source of energy. Both sectors are the region’s largest water users. Both are also at significant risk of collapse, because climate change is steadily reducing levels of rain and snowfall and draining freshwater reserves. The map below shows water allocations for the Basin’s nine provinces. Click through the interactive map to see how a 1987 plan allocated water resources to each of the nine provinces within China’s Yellow River Basin. Source: Wang Yahua, China Environment Series 6. By 2020, without significant water conservation initiatives — and as China’s demand for energy and food increases — we at Circle of Blue, along with the China Environment Forum, concluded that there would be a damaging gap in the Basin’s available freshwater supply amounting to 20 billion cubic meters (5.3 trillion gallons). In other words, farmers and energy producers will be 20 billion cubic meters short of the water they need to operate. 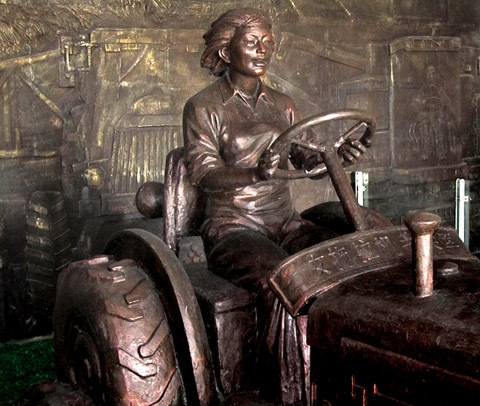 A bronze statue of Liang Jun, the first Chinese woman to drive a tractor in the 1950s. When she was a very young woman, Liang Jun was one of the tens of thousands of durable adults dispatched by China’s new Communist Central Government in the early 1950s with orders to break open the prairie of this cold and formidable northeast province. Until agronomists and engineers from the Soviet Union offered their assistance, and their steel-tracked grey tractors, the work of cutting open land that was bound together by the uncut roots of centuries of tall prairie grasses was done by hand, one chop and heave at a time. Winter temperatures here can plunge to -37 degrees Celsius (35 degrees below Fahrenheit). Summers are hot. Workers lived in crude grass and sod and wooden huts. Women worked alongside men, their hands protected by thick cotton gloves, their hair and faces wrapped in white scarves, the long tails streaming in the wind. Liang Jun is in her 80s now and lives in Harbin, a provincial capital city of 10.6 million people that is 700 kilometers (435 miles) to the west of this modern prairie city of 40,000. She doesn’t grant interviews, farm officials told me. Her place in Chinese history, though, needs no further explanation from a Western writer. She was the first woman to drive a tractor in Chinese agriculture, the first female credited with participating in the mechanization campaign that turned this province into the largest grain producer in a nation that harvests more grain than any other country on Earth. For a time, Jun’s image graced the 1 RMB notes that today are worth a little more than 15 cents in the United States. A more permanent honor, a bronze statue of Jun driving a 1950s Soviet-era tractor, is at the center of a handsome ultramodern glass and aluminum museum that honors the machines and productive prairie agriculture that the Chinese developed here and on 113 other state-owned farms in Heilongjiang Province. We presented this finding to scientists and engineers at the Ministry of Water Resources in Beijing in April 2011. When I asked what they were doing in response, they told us about developing policies to significantly modernize and expand irrigation networks and water-conserving technologies and practices in Heilongjiang (pronounced Hey-Long-Jyang) and three other northeastern provinces — Liaoning, Jilin, and eastern Inner Mongolia. I replied that we’d be back. So here we are, accompanied by Wu Jing Yang, our accomplished and indefatigable researcher and translator. It’s our fourth day in northeast China, a region visited by few foreigners and even fewer Americans. The complete findings will be available online later this summer. This cold and formidable northeast region was once a prairie land, first broken open in the early 1950s by tens of thousands of durable adults who were dispatched by China’s new Communist Central Government, including Liang Jun, the first Chinese woman to drive a tractor. Now this region contains enormous fields of newly plowed and planted corn and soybeans, as well as rice paddies, full of growing green shoots. And there are big plans for Heilongjiang Province as it enters the third great chapter of its farm development. Over the next five years, the Central government will spend almost $US 1.3 billion (8 billion RMB) to build new concrete canals, end the leaks in old ones, buy drip-irrigation equipment, install state-of-the-art low-flow sprinklers, and take other measures to bring water to plant roots, while also not testing the boundaries of the province’s water supply, which is generally plentiful, but can also be unstable. The goal is to increase yields at least 20 percent over the next half-decade, a goal that has domestic food security significance here, and global market importance in the United States, where farmers are enjoying the highest commodity prices of their lives. A lot of what the Chinese government wants to do with water conservation and new irrigation practices on small farms has been developed and proven out on some of the world’s biggest farms, including the 45,000-hectare (110,000-acre) YouYi Farm here, the largest in China. Yields on the mechanized and irrigated farm — about the size of a small American county — are equal to, and often exceed, the top American farms. More than 80 percent of its 1-million-tonne harvest of rice and corn, and 150,000-tonne sugar beet crop, is exported to other provinces, according to the farm executives that I met. The YouYi Farm is owned and managed by the Central government in a state farm system that is unique to this province (and now the world, with the collapse of the Soviet Union and its state farms). More than 120,000 people work on the YouYi farm and its related production and processing enterprises that form, quite literally, a world of their own. 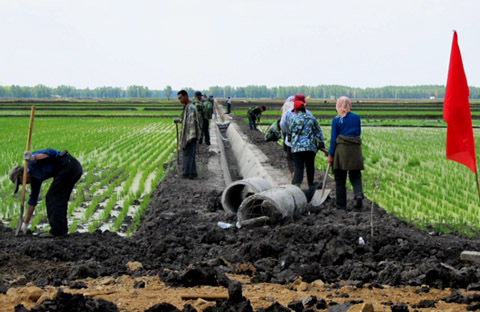 Farmers on the YouYi Farm, China’s largest, work on mud dikes and rice paddies served by a new concrete branch-irrigation canal, as China launches a big program to expand and modernize irrigation and improve crop yields in northeast China. The 1,300 hectares (3,300 acres) of sugar beets raised in immense irrigated fields are processed in the town’s sugar mill. Same for rice and corn. Layers upon layers of farm managers provide employment for top technical graduates, some of them the grandsons and granddaughters of the first generation farmers that include Liang Jun, now in her 80s. The schools, hospital, equipment repair shops, housing, community center, hotels, and other public institutions are managed by the regional farm oversight office here, housed in a grand granite and glass building. The city of wide concrete boulevards, bright street lights, magnificent parks, brand-new high rises and shopping centers is unexpected after a trip through dusty villages over cracked and crowded roads, past fields of new rice and corn, where weeding is still done by hand. In one way or another, everybody connected to the YouYi Farm is descended from Liang Jun.